Engine-powered lift trucks family "RECORD-4S"
As of 2011, new series of new IC trucks RECORD 4S, having load capacity 10000 kg and 12500 kg. are in production. Ask for more details and technical specifications. Other variants are possible upon placing a custom order. Engine-powered lift trucks family "RECORD-2SR"
Combines the best of both design and ergonomics of the RECORD 2S family. The increased clearance and the built-in driving axle with differential lock allow working on both rough terrains and solid surface sites. Engine-powered lift trucks family "RECORD-2S"
High technical performance. Proved efficiency and durability. Low service and maintenance costs. LPG Engine-powered lift trucks family "RECORD-1S"
Compact design and high mobility. Convenience of operation. Optimum price/quality ratio for а machine of this category. 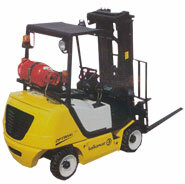 Engine-powered lift trucks family "RECORD-3S"
Powerful and economical. Low noise level and high exhaust gas purity. Comfortable for work – the cabin module is hung on elastic-rubber pads. Engine-powered fork lift trucks family "Record -1S"
Compact design and high mobility. Convenience of operation. Optimum price/quality ratio for а machine of this category. Original harmony of up-to-date shape and excellent ergonomical indexes. Low level of noise and vibration. The engines confirm to the norms for emissions under ISO 8178 and Regulations 49 of IKE/UN.